An early Saturday fire may have destroyed the home of a rural Holton family, but family and friends have helped them to begin recovery efforts in earnest, it was reported. The home of Andrew and Breann (Young) Hinman and their two children — Brooklyn, 2, and Kellan, 5 months — was declared a total loss by Holton Fire Chief Kevin Ingels. The cause of the fire has yet to be determined, Ingels added, although there has been some speculation that the fire originated outside the home by a lamp used to provide heat for a doghouse. The fire at the Hinman home, listed at 12985 206th Road, was reported shortly after 2 a.m., Ingels said, and Holton firefighters were assisted by the Mayetta Fire Department, Jackson County EMS and the Jackson County Sheriff’s Department in extinguishing the blaze and getting the Hinman family to safety. The fire was extinguished in about two hours, Ingels said. 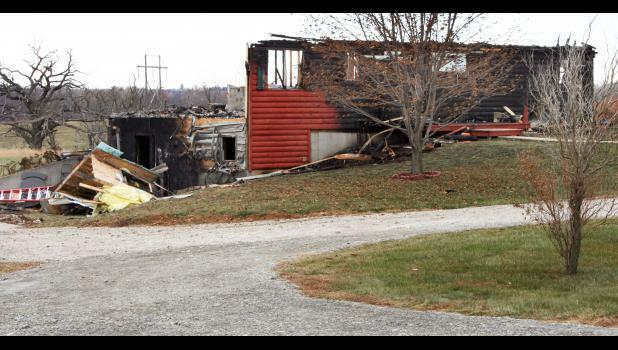 In the aftermath of the fire, family and friends of Andrew and Breann Hinman — both Holton High School alumni — have quickly pulled together to help the family recover from the fire, in which all of the home’s contents were also destroyed. Tonya Raaf, who works with Breann Hinman at Holton Community Hospital, said that many donations have been received — particularly clothing for the family. Raaf may be contacted at (785) 969-3980 for more information on the family’s needs, and donations may be delivered to the nurses’ station at Holton Community Hospital. The creation of a Go Fund Me internet page has provided the family with some help on the monetary side, it was reported. The page (www.gofundme.com/hpdums) was created by Erin Wold, one of Breann Hinman’s former classmates at HHS, and is now being overseen by Raaf, who added that a relief account has been established for the Hinmans at Farmers State Bank in Holton.